Now, on line and in stock ready to ship for 279.95 are our new line of aluminum radiators. Get them before it's hot!!! Last edited by ihpartsjeff; 03-29-2017 at 07:32 AM..
We also have in stock aluminum radiators for 41'-49' k series trucks. Last edited by ihpartsjeff; 08-26-2015 at 08:26 AM..
Getting the Scout ready for summer. Had a few questions before I pull the trigger. Will this bolt in my 79 sii using stock mounts and shroud? Does it cool better than any factory/stock sii radiator? What fan do you recommend? Do you recommend any coolant filter setups to prevent a 33year old engine clogging up this investment? If so, any recommendations? My Scout is bone stock daily driver with a/c and sees light duty wheeling/trail riding once in a while... Mainly need it to idle in traffic with a/c on and not heat up. Lastly, if I have a $50 gift certificate, will I be able to put that towards the $399? Thank you so much for your help. Will this bolt in my 79 sii using stock mounts and shroud? yes it will. Does it cool better than any factory/stock sii radiator? I have no way of an honest answer here as I have no scientific evidence that it does or doesn't. What fan do you recommend? the stock fan. Do you recommend any coolant filter setups to prevent a 33year old engine clogging up this investment? If so, any recommendations? I only recommend that you spend additional time flushing the cooling system thoroughly before installing any new radiator. If any hoses or thermostat look questionable now is the time to replace. I've never used a coolant filter and therefor I don't have any advice to give there. Lastly, if I have a $50 gift certificate, will I be able to put that towards the $399? yes you can. Please call to place your order and have your gift certificate available. Thank you so much for your help. your welcome and thank you for your business. Excellent. Thank you for answering my questions. I did some research on the coolant filter and have decided against it. First, it takes away from the stock appearance when you pop the hood and second the general concesus matches your reply....just flush it good and make sure its clean and everythings in good shape. I just filed my income taxes today so I will be calling you in 7-10 days for sure. Thanks Jeff. Talk to you soon. Got my radiator today and it looks great. Cant wait to put it in. Thanks for the fast shipping too. Thank you Jeff. 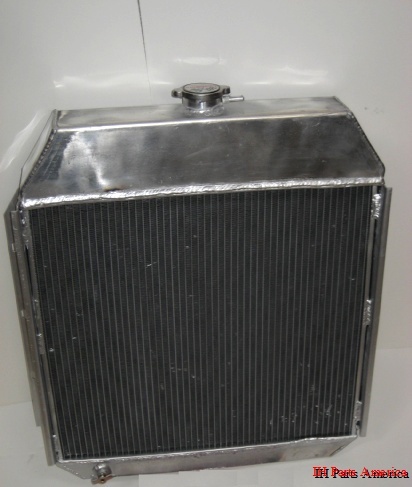 Just wanted to let everyone know that we have the Scout II aluminum radiators back in stock and ready to ship. Same price as before and like before we will include at no extra charge mounting hardware for the radiator itself and fan shroud. I have a 71 Scout II. The radiator is leaking, so my question is weather a aluminum radiator is better then the original copper one. New to the site, and this is my first post. Any feedback would be welcomed. The engine is a 304v8. Thanks ahead of time. The aluminum radiators that we carry are lighter and less expensive and are made in china. The copper/brass radiators that we carry are an exact factory replacement, are more expensive and made in the usa. For your 304 v8 I don't think it will matter which one you go with. As far as we know all champion brand aluminum radiators are made in china. 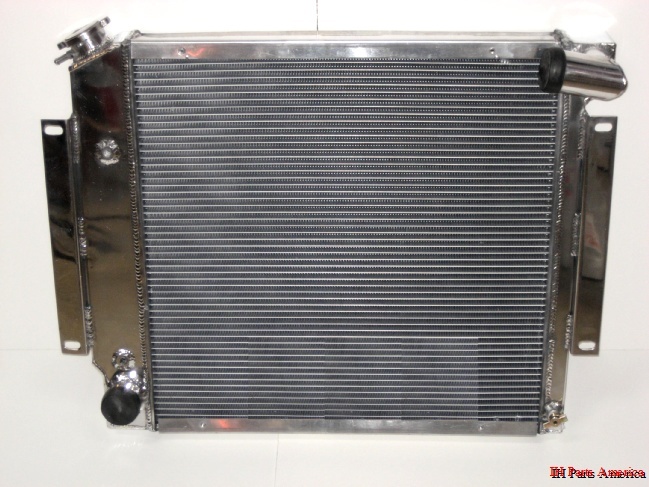 I bought an aluminum radiator for my 79 345 ci do just plug the two vacume lines that go to the stock rad. If you have the emissions vacuum switch that went into the radiator then yes, you can remove the vacuum lines and plug where they went. Or you can have a radiator shop/welder weld an aluminum bung into the radiator to thread in your old fitting if you have to deal with a visual inspection for smog. Thanks.